In my Oct 17 blog post, I introduced you to Jonathan Baker who appeared in a March 13, 2016 Bloomberg article which was reprinted in the Vancouver Sun the following day. The 78-year old retired lawyer and his wife had sold their Dunbar area home for $3mill in December 2015 and purchased a 4200sf waterfront home in Sechelt for half that amount thus pocketing a tidy profit of $1.5mill which the average Vancouver worker could never save in a life-time. At the end of that post, I suggested that this early March article may have had an impact on Sunshine Coast sales. Now, look at the chart below and check out sales in April and May. Do you think this is purely coincidence? I don’t think so otherwise Realtors® and developers would never hunger after listing or project profiles in the press. I’ll post today’s entire G&M article shortly; now, back to the task at hand. 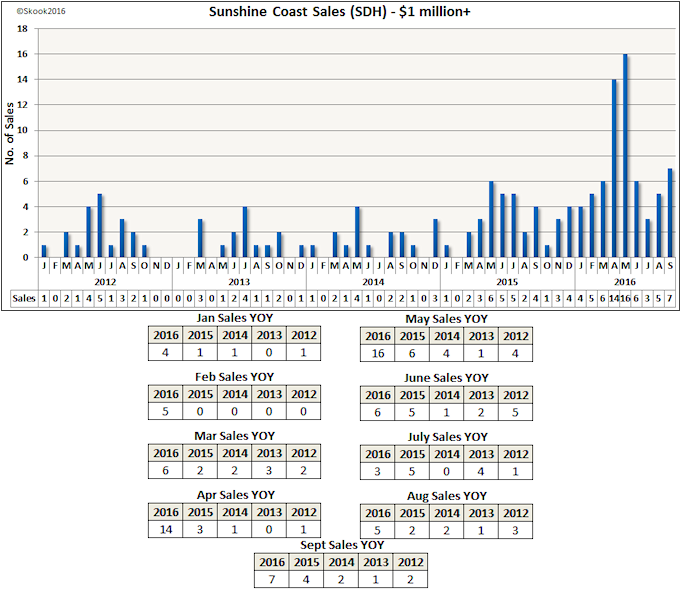 To date, sales of Sunshine Coast million dollar properties have been stellar. The sales are up +136% for the same period last year and a whopping +408% on 2014 - well, shoot me to the moon! 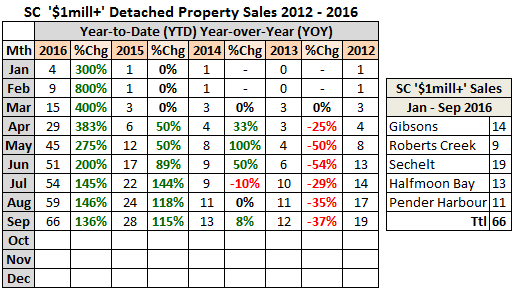 Sechelt led market areas with 19 sales; however, in relation to their total year-to-date sales, Halfmoon Bay is the big winner with 15.9% of sales in the million plus range followed by Roberts Creek at 15.5%, Pender Harbour at 11.1%, Gibsons at 6.1% and Sechelt at 5.4%. 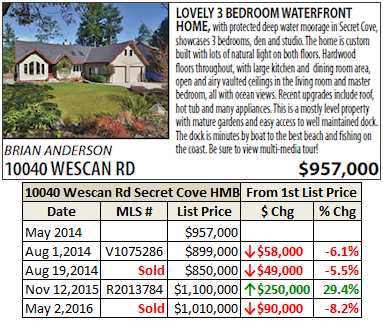 The lowest million dollar property sale in this time frame was 10040 Wescan Rd in Halfmoon Bay’s Secret Cove and the most expensive involved three combined waterfront lots in Sechelt at 5845-5851 Sunshine Coast Hwy. The two properties have interesting listing histories. 10040 Wescan is straight forward. It was listed sometime before May 2014 (the ad comes from the May 2, 2014 Coast Reporter Real Estate Weekly), was relisted August 1, 2014 and sold three weeks later. After 15 months, it was on the market again (November 12, 2015) and it sold 6 months later. Not a bad looking return-on-investment, I would say. 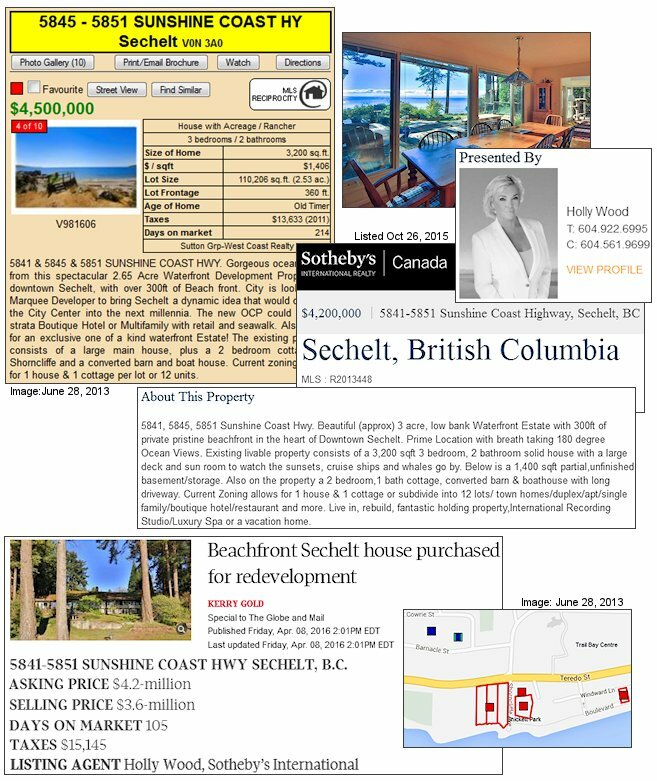 Now the Sechelt property has a very interesting history. It first caught my eye back in early 2013 and I finally decided to grab a listing screenshot on June 28. It was 214 days on market by then which means it was initially listed on November 1, 2012. I don’t think there had been a price drop between November and June but I can’t be 100% certain. “...catapult the City Center into the next millennia...” Ohhhh, I like that. I think someone had been talking to then Mayor John Henderson. Alas, no expert in medieval siege warfare could be found and the lots were on and off the market until October 26, 2015 when they were listed anew. Leading the charge, no less than Sotheby’s West Van specialist in near everything: ”senior real estate specialist, global property specialist, waterfront specialist, certified luxury homes marketing specialist”; and, Realtor® of near everywhere: ”West Vancouver and North Vancouver, Gibsons to Sechelt, Old Shaughessy to Point Grey Rd, Vancouver and along downtown's most beautiful luxury waterfront locations”. Yes, none other than Ms...Holly Wood. The Action: Owners of the estate had received several low-ball offers and one offer from a developer that fell through. The property was purchased by a businessman who plans to redevelop it, says Ms. Wood. “This offer was a 10-day close – that’s why [the sellers] took it,” says Ms. Wood, a Vancouver agent who’s working more often on the Sunshine Coast. Yes, delicious...delicious enough to make CMHC see red.